The WDS-576 has a Schneider Apo-Symmar 5,6/150 L in Copal 0 shutter mounted in a helical focussing mount. This lenspanel is to be mounted to the WDS-500 body in combination with the WDS-504 revolving ground glass back and a spacer (included). 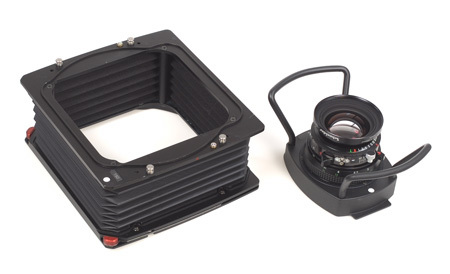 Schneider stopped production of the Apo-Symmar 150, existing stock is sold out.